In honor of the holiday, we will look at this fantastic house in Ambridge, a small and old mill town that was built around the old American Bridge Company, along the Ohio River in Beaver County. The borough was initially branched off of Old Economy Village, a communal Christian settlement in the 19th Century. The village is preserved nearby as a living history museum. We had heard great things about this house and decided to drop in and check it out. The decorations of this house have won national awards, and I am fully convinced that they could not possibly fit more lights onto each square inch of this house and yard. Bob Dunn estimates that he has hung over 20,000 lights at his house. If that was not enough, Santa Claus, Mrs. Claus, and an elf show up to greet everyone that drops by the visit. They even have a donation box to give to St. Jude's. Annually they raise roughly 2000 dollars for this great organization. Overall, we highly recommend visiting this awesomely decorated house. It is well worth going out of your way to see. We had breakfast at Kane, PA's Texas Hot Lunch Restaurant. This family owned diner/restaurant is as good as any diner that we have visited and we highly recommend checking out the restaurant and its spinning ice cream cone sign. I did not take a photo of the Kane's beautiful old Pennsylvania Railroad building on this visit, however we highly recommend checking it out. It hosts art exhibitions and more. 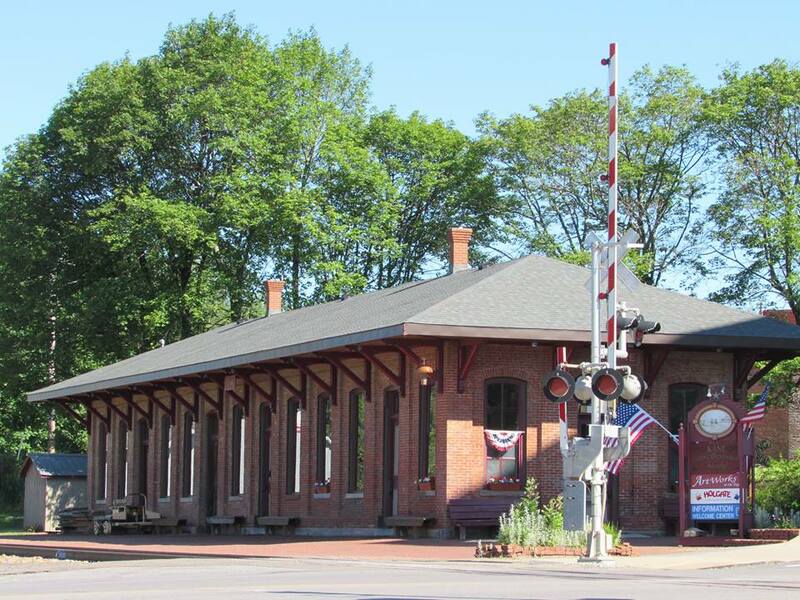 Kane's second beautiful train station was originally located in Rockton, Clearfield County. This classic train station building was moved around to the locations of three different tourist railroads. Blairsville, Gettysburg, and its current location, Kane, where it was in the midst of being reassembled for use on the former Knox and Kane Railroad. I would love to see some life be restored into this station, for it is a nice complement to the stunning Pennsylvania Railroad station on the other side of Kane. The borough is a great launching point to beautiful places like Kinzua Bridge State Park, and Allegheny National Forest. Today we check out the awesome Zippo / Case Museum in Bradford, PA. This museum in Bradford talks about this history of the Zippo Lighter and Case Knife Company, which both originated in Bradford, PA. The museum features thousands of different Zippo Lighters both on display, and for sale. It covers the pop culture impact of these lighters and is pretty neat to see. The tour starts with "old glow'ry" a flag made with 3300 Zippo Lighters. The museum is filled with all kinds of pop art featuring their products. A giant lighter mechanism that is used to display some coveted lighters. An art piece featuring some heavily worn out lighters. The placement of a Zippo lighter in this soldier's pocket was able to save his life through deflecting a bullet. Zippo lighters are covered with a lifetime guarantee. If they cannot fix them, they send you a replacement unit. Here are some comically destroyed units, run over things like dump trucks, trains, thrown into wood chippers, garbage disposals, and more. These units were certainly replaced instead of repaired. There are windows that look into a shop area in which they complete all warranty repairs. The museum has a ton of cool neon. We ended up sitting and watching this audio-kinetic ball machine for at least twenty minutes or so. These things are so entertaining. As you leave the museum, you get a glimpse at the entire Zippo and Case product lines, at factory outlet pricing. If you head into town, you can see the Zippo Company's corporate headquarters, which has not only embraced the place where it originally come from, but also expanded in it. Something that is very admirable in this day and age. Be sure to head to Bradford and check out this awesome place. One of the finest holiday displays in the country is located right in rural Berks County, Koziar's Christmas Village. This display started as a a simple dairy farm that was heavily decked out for the holidays. Soon people began to ask permission to walk around and see the displays, and this amazing attraction was born and has grown ever since. Some of my earliest memories were made here and there is nothing quite like the joy that a visit to Koziar's brings to me. Koziar's Christmas Village is located in Bernville, PA, just south of Interstate 78 in Berks County. This is a special place where family memories are made as brightly as the 500,000 antique style, large bulb, Christmas lights that Koziar's uses. Some of my earliest memories were made here. There is nothing like sipping a cup of hot chocolate and walking around this attraction that has been family run and owned since 1948. As you meander through the rural countryside that Koziar's is located in, you see nothing but darkness. As soon as you crest over the hill and get your first glimpse of Koziar's you are hit withthis incredible onslaught of light. Its sheer brilliance is incredible. An old farmhouse and a number of other buildings make up this attraction, complete with many cute displays, several miniature railroads, and more. If you want to make a day out of a visit to Koziar's, be sure to swing by Roadside America, a world class miniature railroad museum that is located only 15 minutes from here. The barn, with an outdoor miniature railroad display. Koziar's is as mesmerizing now as it was decades ago when I was a little kid. Appreciating the great work ethic this family has with their labor of love makes this even more impressive.